One En-Chanted Evening: Seven of the 15-member Vedic Vibe ensemble raise their voices to help children with Type 1 Diabetes. From left: Deborah Adelin on cello, Sam Cox on cymbals, Scott Fraser on tamboura, Harb Gill on harmonium (harmonium not in picture), Phil Gunter on oud, Katrina Leavitt, and Boaz Modman on derebouka. photographer: peter casamento. East embraces west: Vedic Vibe musicians for One En-Chanted Evening include (from left, rear) Deborah Adelin on cello, Phil Gunter on oud, Scott Fraser on tamboura, Katrina Leavitt and (front) Sam Cox on cymbals, Harb Gill on harmonium and Boaz Modman on derebouka. photographer: peter casamento. world-renowned musician Dya Singh raises his voice to help children. Sitar supremo: Dr Sarita McKenzie-McHarg has a doctorate in ethnomusicology and has performed all over the world. 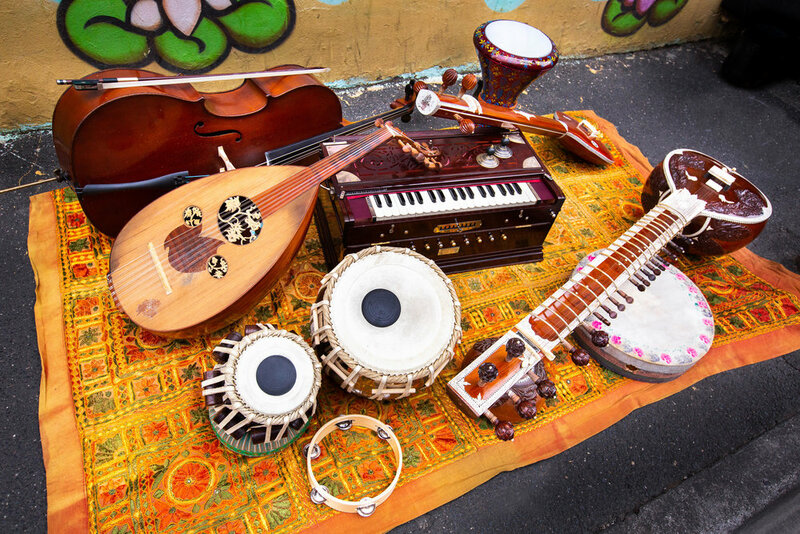 Vedic Vibe instruments include (clockwise from left): Cello, oud, harmonium, tamboura, derebouka, sitar, frame drum, tablas and tambourine. photographer: peter casamento. 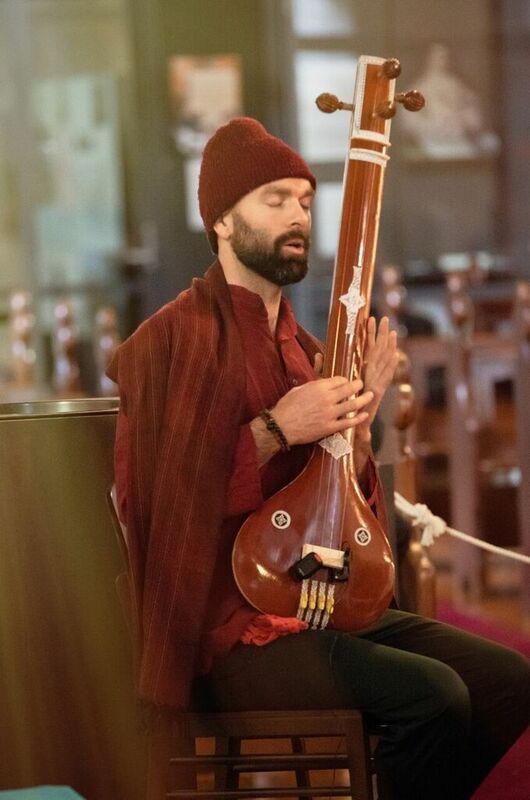 Oud times: Phil Gunter plays the oud, guitar and merdang in the 15-member Vedic Vibe ensemble for One En-Chanted Evening. One En-Chanted Evening: Artistic director Harb Gill pays homage to the light without, and within everyone. Photographer Meluke Gunter.